Basford offers a comprehensive coaching programme for all ages and abilities. The club’s resident coach Mike Armstrong is qualified and accredited as a Lawn Tennis Association Performance Coach and has over 10 years coaching experience. He has been Disclosure and Barring Service (DBS) checked and has Safeguarding and First Aid training. Over the years Mike has worked with county and nationally ranked players, including two players who have received tennis scholarships at American Universities. Group sessions for juniors are run during term time as pre booked courses. These courses commence at the start of each school term and run for around 10 weeks. Sessions are open to both members and non members although members enjoy discounted rates. Players may try a session by paying on the day for that one session and can join part way through a course and pay on a pro rota basis (if spaces are still available). Mini Tennis Saturdays 1:00-2:00pm For younger children aged 4-9. Sessions aim to improve children’s athletic skills and basic tennis skills using low pressure balls. Junior Improver Fridays 5:00-6:00pm For more advanced young players aged 8-12 who are moving onto playing on a full sized court with mini tennis green balls. Advanced Fridays 6:00-7:30pm For advanced juniors who are playing competitive tennis. Sessions concentrates on fitness, technique and match play. 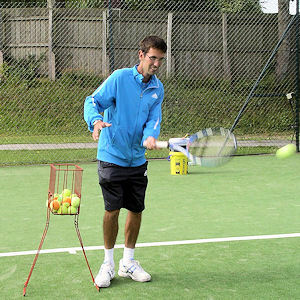 During the school holidays the club runs tennis camps and match play events. These sessions must be pre booked and can fill up quickly. Prices and further details of regular coaching, tennis camps and matches can be obtained by phoning Mike on 07412 037774 or emailing miketenniscoach@yahoo.com. 30 and 45 minute private lessons can be arranged and Mike also offers a restringing service should your racket require new strings. If you wish to book a private lesson or for any coaching enquires please contact Mike on 07412 037774 or email miketenniscoach@yahoo.com.